Don't laugh. This guy's for real. 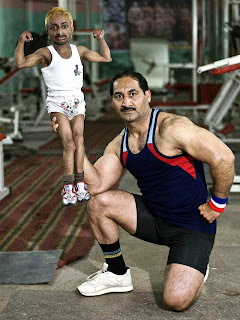 I just wanted to show you a picture of the world's tiniest weight lifter (little guy on the left). His name's Aditya "Romeo" Dev. He stands 2 feet 9 inches tall, and weighs a little less than 20 pounds. And sometimes, when I look out at the big, wide world, or gaze across the street at my neighbor's absolutely massive flat-screen TV, I feel a bit like him - very, very small. 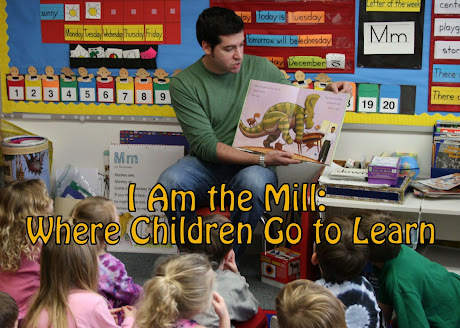 Or at least, that's what I imagine he must feel like. The similarities don't end there. Both Romeo and myself can lift in excess of 5 pounds, and we're rather proud of our physiques. Additionally, as you can see from the photo, Romeo is incredibly well-proportioned for a man of his unusually small size. Likewise, my torso forms a perfect golden rectangle. And my head is a nearly flawless oval - smooth and gently curved - as if it's spent a good amount of time in a gem tumbler. I can't say for sure that it hasn't. Sometimes, you know, it does feel like my head's been put through a spin cycle, so to speak. And the big city is just an overwhelming maze of cement and glass. And trash and Starbucks. I wonder if I really belong here. Can I make it in this concrete jungle? But then I take a page out of Romeo Dev's miniaturized notebook. He's the smallest guy in the gym. Always. Anywhere he goes. That's guaranteed. And what's also guaranteed is the reactions he'll get when he walks into that gym. Shock, surprise, ridicule. I'm sure he's seen it all. But he keeps working out and keeps pumping tiny iron, blocking out the stares and whispers all around him. And you know what? He's proud to be the littlest guy. He strives to be known as the strongest toy-like, fully-grown human in the world. And he may have already achieved his goal. But that's ultimately up to the good folks over at the Guinness Book Of World Records. I wish I could say I was the best at something, for someone of my size. I'm certainly not nearly the strongest, or the smartest, or the fastest 6-feet tall, 180 pound guy in the world (of all 2 billion or so of us out there). But I'm also not the weakest or the dumbest - if you'll allow me to toot my own horn for a moment. I'm ok with that. I am who I am. And Lil' Romeo is ok with it too. and who better to be you? my guess is you do a great job, even if you're basicall a work in progress. Thanks for the post. and who better to be you? my guess is you do a great job, even if you're basically a work in progress. Thanks for the post.